Have you heard of Sketchnoting? Instead of producing densely scribbled pieces of paper that you never look at again, take sketchnotes: go spatial, add icons and structure to visually capture information. This way you can easily tell one note from the other, are likely to retain more and to actually look at your notes. Sometimes just because they’re pretty. Corinna Baldauf sketchnoted at Agile 2015 and after some people joined her, she did an impromptu session about easy tricks to spice up sketchnotes. The above is a sketchnote about sketchnotes – quite meta, huh? 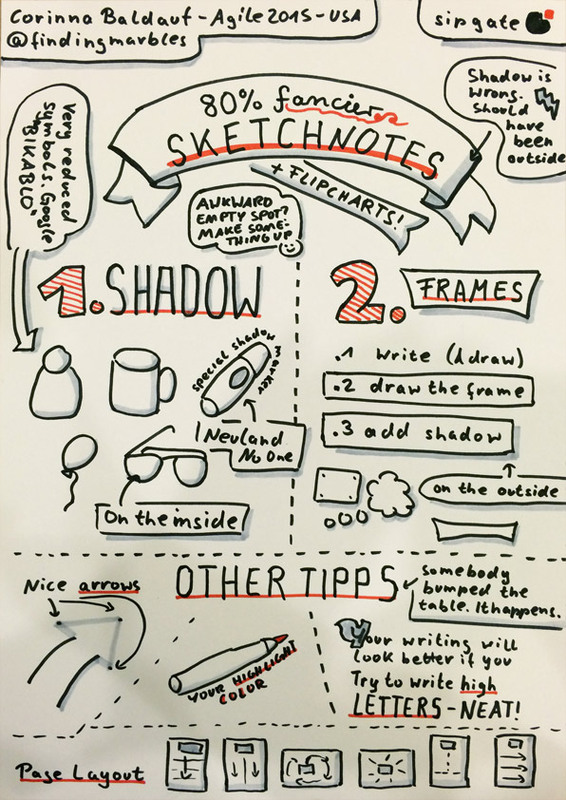 You’d like to know more about Sketchnotes? Check out Mike Rohde’s book. I just learned to sketchnote this summer from Mike’s book. Can you share what pens you’re using? Also the Twitter button makes a tweet that’s >140 characters and the hashtags are funny! I really love creating sketch notes or graphical recordings. I learned it from Benjamin Felis during the Scrum Gathering sept 2014 in Berlin.